About the group Get your detective caps on and help the Activity Team locate examples of Scottish Vernacular Architecture in the Aerofilms collection! [SPW040401] Dunfermline, general view, looking towards Dunfermline Abbey along Elgin Street. An oblique aerial photograph taken facing north. Andrew Carnegie's birthplace in Dunfermline. 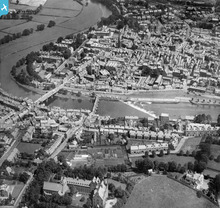 [SPW022241] Dumfries, general view, showing Old Bridge, New Bridge and Whitesands Caul. 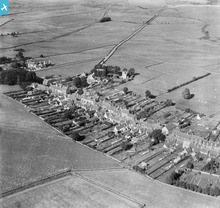 An oblique aerial photograph taken facing north-east. Bridge Cottage in Dumfries is a very small stone building with a basement and a loft. 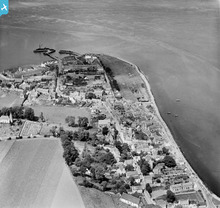 [SPW033787] Cromarty, general view, showing Church Street and Cromarty Harbour. An oblique aerial photograph taken facing north. 'The jewel in the crown of Scottish vernacular architecture', Cromarty is one of the best preserved historic towns in the Highlands and an outstanding example of an 18th /early 19th century Scottish burgh. Its character comes from a rich mixture of small fisherman's cottages, fine Georgian town houses and Victorian commercial buildings, featuring architectural detail such as crow-stepped gables, slate roofs, marriage stones and datestones. Cromarty is home to the thatched fisherman's cottage where the influential self-taught geologist Hugh Miller was born in 1802 (http://canmore.rcahms.gov.uk/en/site/14437/details/cromarty+church+street+hugh+miller+s+cottage/). [SAW009334] Gilnockie Tower, Hollows. An oblique aerial photograph taken facing south. Tower houses can be found across the Scottish Borders. Built to protect against the violence of cross-border strife and inter-family feuding, a tower house was a permanently occupied, fortified residence. Built from the mid-14th to the 17th century, they are rectilinear in plan, often with one or more additional wings, and provide accommodation on several storeys. 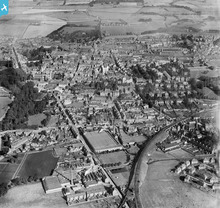 [SPW034395] Kirkcowan, general view, showing Main Street and Newton Stewart Road. 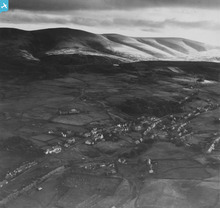 An oblique aerial photograph taken facing north-east. Kirkcowan is a single street village in Dumfries and Galloway. Most of the dwellings are traditional, low, single storey cottages and this photo from 1930 shows that they have tiled or slated rooves. An earlier photograph from 1860 (http://www.scran.ac.uk/database/record.php?usi=000-000-100-041-C) shows that once these had all been thatched with straw or heather. [SAW019794] Leadhills and Lowther Hills. An oblique aerial photograph taken facing south. This image has been produced from a print. Leadhills is the second highest village in Scotland after nearby Wanlockhead. It owes its location to the rich lead deposits which were mined on an industrial scale from the 17th century. When in 1735 the mines ceased to be profitable, the Scots Mining Company appointed James Stirling as a Manager. He began to radically reform the working and living conditions of the mining families, securing for any miner the right to land for houses and plots of ground or ‘yards’ for cultivation. The cottages and gardens scattered around the hillside in Leadhills are a modern reminder of how land tenure has influenced the pattern of development in the village. The main building type at Leadhills is the single or one-and-a-half storey cottage row. This traditional ‘basic cottage’ design includes low eaves, and a single door with windows to either side. The front entrance door is usually positioned off-centre within the front elevation to the property. Get your detective caps on and help the Activity Team locate examples of Scottish Vernacular Architecture in the Aerofilms collection! We know you love browsing the collection and discovering incredible content in the Aerofilms images…so how about fine-tuning your research skills and channelling your enthusiasm in aid of the team? Not only will you be providing invaluable support to the work of our colleague Brian (Activity Officer for Scotland), you will also be entered in a draw to win a print of your favourite Aerofilms image! -Find examples of Scottish Vernacular Architecture on the Britain from Above website. -Tweet or DM the word ‘Vernacular’ and the image reference to @AboveBritain. 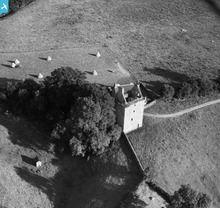 You can also email aerofilms@english-heritage.org.uk, or simply add the image to our Scottish Vernacular Architecture group. Please send your suggestions NO LATER than 29/09/2013. -Every suggestion that fits the criteria of vernacular architecture will be entered in a draw to win an Aerofilms print. The winner will be notified no later than 3 weeks after the closing date. -Remember we are only looking for examples of Scottish Vernacular Architecture, therefore only suggest images with an SPW/SAW reference. -You might want to start by examining Unlocated images ~ Vernacular Architecture is likely to be found in areas difficult to locate! -Use our keyword list for inspiration with your search terms. -Uncertain about an image you’ve found? Suggest it anyway! Your instincts are probably right. -Talk to each other! There might be a pro or a very inspired amateur among you, and it always helps to bounce ideas off one other. Brian will be giving a talk at the Scottish Vernacular Buildings Working Group Conference on October 3rd. He will use the most striking suggestions in his presentation, with grateful acknowledgement of your invaluable assistance. What are you waiting for? Get researching, see what you find!